Passionfruits belong to the Passiflora genus with hundreds of species. 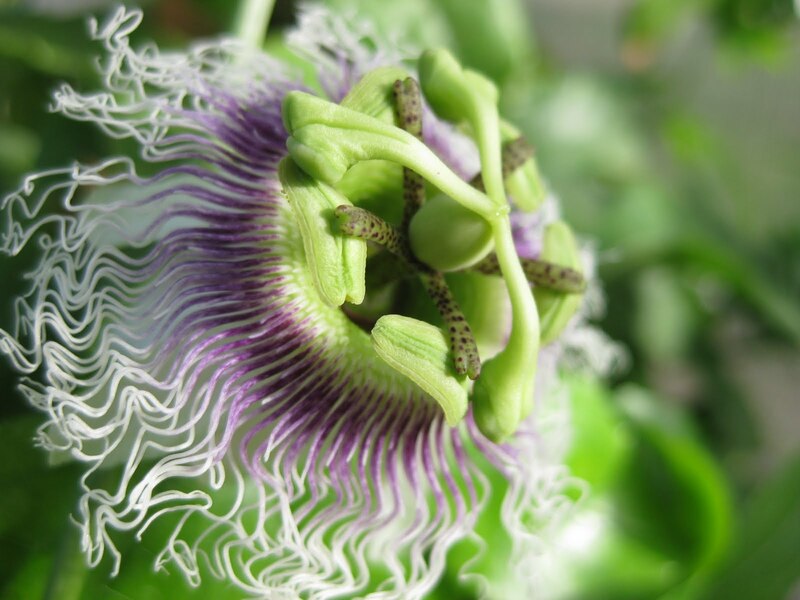 While Passiflora can be found around the world, the most common for eating is the Passiflora edulis species that is native to South America. This species is not frost tolerant which means that the main areas of cultivation are tropical or sub-tropical climates. I have heard of this species doing very well in Hawaii, Florida, and parts of California. Where can you get passionfruit vines? You can either grow them yourself by seed, propagate from a parent plant, or buy a live plant. 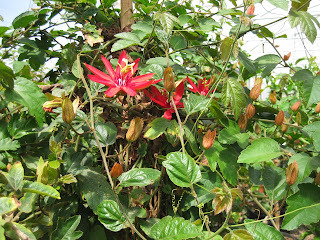 This passionflower (Passiflora edulis) is a great example of the beauty behind these wonderful plants. The passionflower is an exquisite and complex flower consisting of 10 petals, many radial filaments, a centric ovary, 3 stigmas and 5 anthers. This alien flower seems to have a mathematical aspect to its design, a very bizarre specimen and one of my favorite flowers. 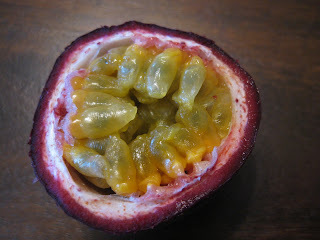 The most important thing about eating passionfruits is knowing the exact species from which the fruit comes. Not all passionfruits are edible so be careful about eating fruits found in the wild. If you find the fruits in the grocery store, they are safe to eat, but be weary of buying Passiflora plants on the internet or at nurseries. If the information given to you doesn't specify the edibility of that species you should refer to the internet. In addition unripe fruits of certain edible species should not be consumed by humans. The fruits of P. edulis are typically purple fleshed with yellow pulp, eat the pulp and discard the skin. Don't be afraid of the seeds, they are edible too; I think of them as larger versions of kiwi seeds. 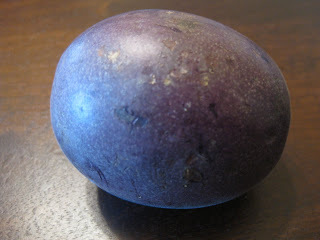 There is a wide variety of culinary uses for passionfruit but its mostly used in desserts such as sorbet. I find the taste to be sweet and tangy but the flavor will vary from each species and variety. This option is less favorable for anyone new to passionfruit; This is because Passiflora seeds have long and irregular germination periods. I would estimate germination to occur anywhere from 1 month to 1 year after sowing. There are countless factors effecting the germination period but most prevalent seems to be the freshness of the seeds. For this reason sow your passionflower seeds as soon as possible after collecting. The advantage to growing passionfruit by seed is their extraordinary potential for hybridization. Hybridizing two different varieties of passionfruit can lead to some truly spectacular flowers. Make sure you have a soil that is well draining and rich in potassium. If the conditions are favorable passionfruit vines will take over! If in a greenhouse be sure to tame the growth of this exploratory plant by pruning the long stems. A trellis or support stake are needed to control the growth of this plant and to provide orderly growth. I would consider caterpillars and snails as the biggest pests of passionfruit but I have yet to have problems with either. However I have had problems with yellowing leaves and this is most likely due to an iron or sulfur deficiency, and is an easy fix with appropriate application of these nutrients. Overwintering is one of the biggest obstacles for many passionfruit growers but there are many ways to combat this issue. One of the easiest is to put it in a greenhouse. For those who wish to grow this plant outside be sure to choose a cold hardy species that suits your climate zone. There are some species of Passionflower that can survive below freezing temperatures although such temperatures are fatal for most commercially grown edible plants. 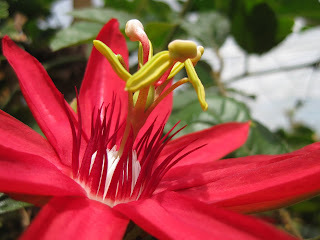 This is a Crimson Passionflower (Passiflora vitifolia). It's supposedly an edible species native to Central and South America. It provides a good contrast to P. edulis, as its petals are a vibrant red and elongated with a wider leaf structure. As well, this species' radial filaments are much shorter than those of the P. edulis. There are huge differences between each species of passionfruit and there are some truly crazy ones out there. In addition hybridization creates an endless variety of flowers.